Enhance voice your costumers experience. 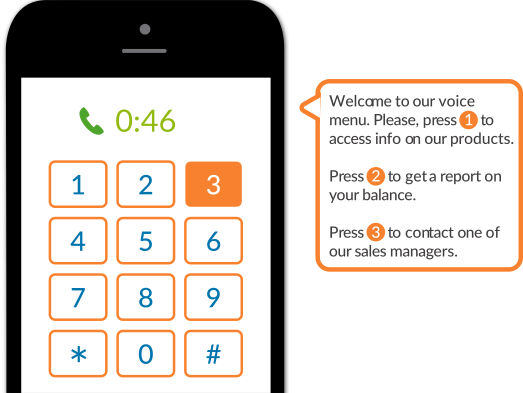 Create voice menus with our cloud-based IVR solution in just minutes ensuring costumers are directed to the rigth persom, ther first time, with the press of a key. We provide powerful real time statistics so you can learn from your data and improve your campaigns. We provide information all the way down to the user level. Include the IVR as a part of the voice broadcast campaign. Ideal for surveys and polls. Save a lot of time by using our natural Text2Speech to create the IVR audio files. Available in several languages and accents. Just select the audio associated with the specific key and select the action. Need to setup MULTI-LEVEL IVR in different countries and languages? Need to send landing pages and collect information from your application? We understand one-size-fits-all does not always work. That's why we will work one-on-one with you to provide a customized solution that works for your particular needs. Personalized high performance Voice Broadcast is the latest technology in the field. It enables users and businesses to reach thousands of customers instantly.